The Solar System is made up of the Sun and all the objects that orbit around it. The Sun is orbited by planets, asteroids, comets and other things. It is billions of years old. The Sun is a star. It contains 99.9% of the Solar System's mass. This means that it has strong gravity. The other objects are pulled into orbit around the Sun. The sun is mostly made out of hydrogen and helium. There are eight planets in the Solar System. From closest to farthest from the Sun, they are: Mercury, Venus, Earth, Mars, Jupiter, Saturn, Uranus and Neptune. The first four planets are called terrestrial planets. They are mostly made of rock and metal, and they are mostly solid. The last four planets are called gas giants. This is because they are much larger than other planets and are mostly made of gas. The Solar System also contains other things. There are asteroids, mostly between Mars and Jupiter. Further out than Neptune, there is the Kuiper belt and the scattered disc. These areas have dwarf planets, including Pluto. There are thousands of very small objects in these areas. There are also comets, centaurs, and there is interplanetary dust. Six of the planets and three of the dwarf planets are orbited by moons. Furthermore, planetary dust orbits the gas giants. Many other systems like the Solar System have been found. Each of the billions of stars in the Milky Way galaxy might have a planetary system. Most of the collapsing mass collected in the centre, forming the Sun, while the rest flattened into a protoplanetary disk of loose dust, out of which the planets, moons, asteroids, and other Solar System bodies formed. This widely accepted model, known as the nebular hypothesis, was first developed in the 18th (1700's) century by Emanuel Swedenborg, Immanuel Kant, and Pierre-Simon Laplace. Its subsequent development has interwoven a variety of scientific disciplines including astronomy, physics, geology, and planetary science. As our knowledge of space has grown, the models have been changed to account for the new observations. The Solar System has evolved considerably since its initial formation. Many moons have formed from circling discs of gas and dust around their parent planets, while other moons are believed to have formed independently and later been captured by their planets. Still others, as the Earth's Moon, may be the result of giant collisions. Many collisions between bodies have occurred, and have been important to the evolution of the Solar System. 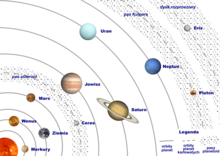 The positions of the planets often shifted, and planets have switched places. This planetary migration is thought to have been responsible for much of the Solar System's early evolution. The Earth's orbit around the Sun is nearly a perfect circle, but when mapped it is found that the Earth moves around the Sun in a very slightly oval shaped, called an elliptical orbit. The other planets in the Solar System also circle the Sun in slightly elliptical orbits. Mercury has a more elliptical orbit than the others, and some of the smaller objects orbit the Sun in very eccentric orbits. For thousands of years, people had no need for a name for the "Solar System". They thought the Earth stayed still at the center of everything (geocentrism). Although the Greek philosopher Aristarchus of Samos suggested that there was a special order in the sky, Nicolaus Copernicus was the first to develop a mathematical system that described what we now call the "solar system". This was called a new "system of the world". In the 17th century, Galileo Galilei, Johannes Kepler and Isaac Newton began helping people understand physics more clearly. People began to accept the idea that the Earth is a planet and moves around the Sun, and that the planets are worlds with the same physical laws that control Earth. More recently, telescopes and space probes have led to discoveries of mountains and craters, and seasonal meteorological phenomena such as clouds, dust storms and ice caps on the other planets. The planets are the biggest objects that go around Sun. It took people many years of using telescopes to find the objects that were farthest away. New planets might still be found, and more small objects are found every year. Most of the planets have moons that orbit around them just as the planets orbit the Sun. There are at least 173 of these moons in the solar system. Pluto had been called a planet since it was discovered in 1930, but in 2006 astronomers meeting at the International Astronomical Union decided on the definition of a planet, and Pluto did not fit. Instead they defined a new category of dwarf planet, into which Pluto did fit, along with some others. These small planets are sometimes called plutinos. There are a few main parts of the Solar System. Here they are in order from the Sun, with the planets numbered, and the dwarf planets marked with the letters a - e.
The Oort cloud is separate from the trans-Neptune region, and much farther out. It contains the long-period comets. The plane of the ecliptic is defined by the Earth's orbit around the Sun. All of the planets orbit the Sun roughly around this same orbital plane. The farther away from this plane a planet orbits, the more inclined is its orbit to the ecliptic. If you could look at the solar system "edge on" then all the planets would be orbiting more or less in the plane of the ecliptic. ↑ More precisely, 99.86 of its known mass. The total mass of the bodies in the Oort cloud is not known. Jupiter and Saturn account for 90% of the remaining 0.14%. ↑ R. Gomes H.F. et al (2005). "Origin of the cataclysmic Late Heavy Bombardment period of the terrestrial planets" (PDF). Nature 435 (7041): 466. doi:10.1038/nature03676. PMID 15917802. http://www.nature.com/nature/journal/v435/n7041/pdf/nature03676.pdf. ↑ A. Morbidelli J. et al (2000). "Source regions and timescales for the delivery of water to the Earth". Meteoritics & Planetary Science 35: 1309–1320. doi:10.1111/j.1945-5100.2000.tb01518.x. ISSN 1086–9379. ↑ WC Rufus. "The astronomical system of Copernicus". Popular Astronomy 31: 510. http://adsabs.harvard.edu/full/1923PA.....31..510R. Retrieved 2009-05--09. ↑ "IAU 2006 General Assembly: Result of the IAU Resolution votes". IAU. Retrieved 2018-09-04. Wikimedia Commons has media related to Solar System. This page was last changed on 12 April 2019, at 17:36.